Let’s face it, despite the advances in technology, from time to time we all like settling down to write on a nice crisp page of a quality notebook. Some people think they write better longhand; that the creative juices flow more freely. Only problem – you don’t end up with easily editable soft copy. 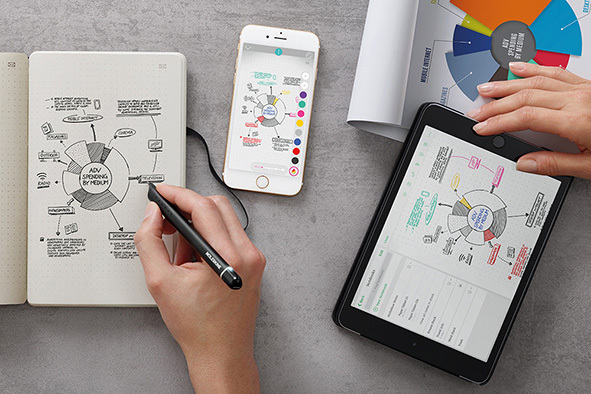 The kit comprises a ‘special’ paper notebook with the style and feel of a traditional Moleskine, a ‘smart’ pen plus a companion app. It’s so simple. First, charge your pen and download the app onto your tablet or phone. Open the app to register your pen. Take your notebook and pen, start writing! The notebook’s got thick 100 g/m² paper – perfect for writing and sketching – while the tech embedded in each page allows the pen to recognize where it is inside the notebook and to transfer what you’ve written from page to screen – all without taking a photo, uploading files or scanning docs. You’re then free to edit, share or export your words and drawings. You can use tags to keep things nicely organized, and sync content to ensure your precious thoughts and documents stay connected. Additional notebooks can also be easily purchased easily. Even if you don’t have your tablet or phone handy you can still use the pen as the stuff you write will be stored in the internal memory ready for when you power up your tablet again. It really is the perfect Executive Gift for someone that has everything! Or maybe a great Incentive Gift for the person that wants everything! For Promotional Moleskine notebooks and other great new and innovative promotional merchandise ideas talk to Arcadia.